Thank you for taking the time to visit my website. I hope you will take advantage of the information here. Each of my books has its own page and most include some behind the scenes details you won't find elsewhere. You can read the first chapters of each book. Click on 'Books' on the menu line above then choose the one you want to find out more about. There is also a list of which books are in each series. Do have a good look around. I'm published mainly as Anna Jacobs, writing historical sagas and modern family/relationships novels alternately, and I used to write fantasy novels as Shannah Jay. There is a link to my email newsletter at the bottom of this page. It's sent out by MailChimp. In September my 83rd novel will be published - One Special Village. I love telling these stories. ** In January 2018 my 81st novel came out. 'One Kind Man' is the second in the Ellindale series, and I got the idea for it because my lovely husband is one of the kindest people I've ever met. A man like that makes a difference to people. And so does my hero! Most of my books are reprinting regularly so if you want to read a previous title, you should be able to find it on line or order it from your local bookshop. Things are changing greatly in the book world and some of my very early books, long out of print, have now been published in large paperback format via Amazon's CreateSpace system by my clever husband. 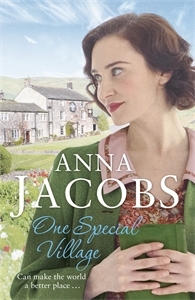 If you put 'Anna Jacobs CreateSpace' in the search box at Amazon you'll find them. All my books are, of course, available as ebooks and all go into audiobooks and large print too. Because I moved to another town a couple of years ago, I've had to close down my PO Box, but of course I can't remove this information from books already published. I can no longer receive letters/snail mail, but you can still contact me by email - see below. WHICH BOOKS ARE IN EACH SERIES? If you want to know which books are in each series, click on 'Series' on the menu line above. All the series are listed there. If you want to read about a specific book, click on Book List above and then click on the title of the book you want and you'll find more information. If you watch the Latest Books section on the right, you’ll see the covers for my recent publications. The covers change about every 15 seconds. 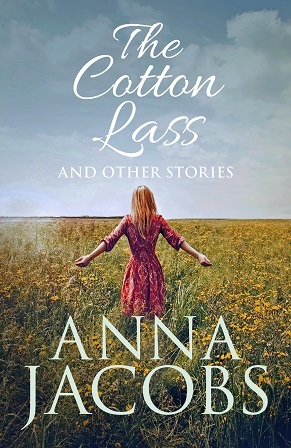 Below that is a link to my Facebook page 'Anna Jacobs Books' which you may find of interest as well. There is other information on this website, including photos. You can find out about it from the menu line above. We have changed our email newsletter system to MailChimp. You can sign up to the newsletter using the MailChimp online form.